EVERYTHING BROUGHT TO CAMP SHOULD BE LABELED WITH CAMPER'S NAME. The Gan Israel Staff will make every effort to keep campers' belongings safe and in good condition; however, we are not liable for broken or lost items. We cannot guarantee the return of unlabeled items. All unlabeled items will become camp property if not claimed by the time campers leave. We are excited to announce a new service we are promoting in 2018 to help you easily purchase the items on your Gan Israel packing list. 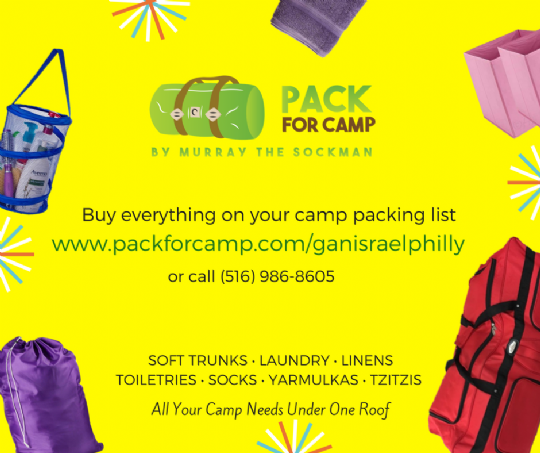 Pack for Camp by Murray the Sockman is a family-run online store that offers everything you need for summer camp under one roof. They sell all the items you expect to find on a camp packing list: soft trunks, bedding, laundry accessories, toiletries, storage solutions and more.